Don’t be average when you can be Epic! Laser tag is a highly engaging experience that combines immersive environments and group play. It’s an exhilarating game that allows players to escape reality and enter the fantasy world inside the laser tag arena. The arena is complete with larger-than-life props, detailed murals, effects lighting, vibrant colors, and music. It’s a perfect attraction for the family entertainment industry, with the primary demographic between 6 and 14 years of age. Birthday parties make up the bulk of the revenue for this primary demographic, but they aren’t the only focus. Adults and Millennials are a growing market that are generating more and more revenue each year. This generation grew up with video games and are accustomed to the immersive graphics and environments found in popular gaming platforms. You can capture their attention and their revenue with a fun, highly immersive laser tag experience. These are the kind of experiences we build for our clients. This belief is the driving force behind our company and everything we build. Our laser tag arenas are fully themed, immersive environments that transport your guests to a different world. As a business owner, you have to compete with rapidly advancing in-home entertainment technology: 4k screens, realistic gaming graphics, and unlimited online streaming of movies and shows. The only way to get these consumers out of their homes and into your center is to provide an amazing experience they can’t get anywhere else. We understand this, and it’s why we build our laser tag arenas with 3 things in mind: design, theme, and experience. Design – The arena is customized to meet the needs for your market. Sight lines, strategic balance, player interaction, and safety are just a few of the considerations that go into ensuring your arena design encourages repeat play. Theme – We combine your vision with inspiration from the latest movies and video games to create the best theme possible. Your customers will feel a sense of familiar and foreign elements inside an engaging and immersive environment. Experience – To get customers in the door, you have to compete in-home entertainment. Our goal is to WOW your guests every time they step inside your laser tag arena. 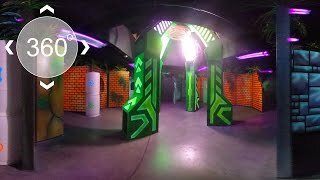 It’s a journey to add a laser tag arena to your facility. So often companies will talk about having the best themes, or the best quality, or the best props. These factors are obviously important, but they are not enough. Who’s going to work with your architects, contractors, electricians, inspectors and fire marshals? Who will educate these people and manage the process? Adding a laser tag attraction is a complicated process and we are here to make your journey a whole lot easier. The journey is long, and we know you’re not going to make any decisions about who to partner with today. The early part of this process is all about education. We’re laser tag experts and we want to give you the tools, knowledge, and resources to be successful. In fact, we host an event called LaserTAG360, which is entirely dedicated to laser tag education. During this 2-day educational seminar, we teach you everything you need to know from site design and funding qualifications to laser tag operations and online marketing. We host LaserTAG360 3 times every year, so you’re never more than a few months away from the next event. Whether you’re opening a new laser tag facility or adding this attraction to an existing business, you want to WOW your customers. You’re not in the entertainment business to simply be “good enough”, and neither are we. We strive to build the best laser tag attractions in the world, and we want to work with you. For 2 decades, we have established our company as the largest designer and builder of laser tag arenas. We have installed more than 250 laser tag attractions in the last few years alone. That’s great, but what does it mean for you? It means peace of mind. We empower you with the resources and project management services that are vital to your success: coordination with your architect and general contractor, build-out recommendations and best practices, checklists and training materials, technical support, and a whole lot more. Take a look at some of the work we’ve done for our amazing clients below, and request a quote to see what we can build for you. 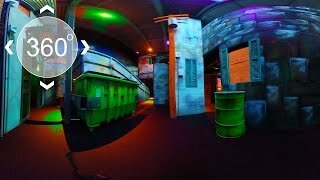 How much space do I need for laser tag? This depends on how many players you want to fit in the arena. All in, you need 150-182 square feet per player. This is divided up between the arena, the vesting room, the briefing room, and the control room. What laser tag equipment should I use? It makes no difference to us, as our arenas are flexible enough to work with any equipment. We regularly work with 4 of the best equipment vendors on the market: Delta Strike, Laser Blast, Laserforce, and Zone Laser Tag. Get in touch with them to see which equipment best suits your needs. What theme should I choose for my arena? This depends on a lot of variables like your geographic location, the demographic you want to reach, the existing competition, etc. Request a quote and we can learn more about your situation during the discovery call. Then we can make some educated recommendations. Are your arenas custom designed? 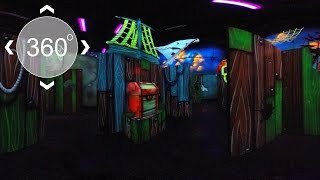 Our laser tag arenas are all built to be immersive themed environments. You might choose a visual aesthetic that is more common among laser tag attractions (like a space adventure), or you might have a completely custom theme designed around your own intellectual property. In every case, our design team creates custom layouts and architectural prints specifically for your space (size, shape, flow, etc). There is no one-size-fits-all with these attractions. 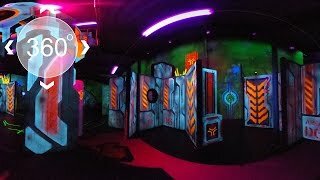 How much does a laser tag attraction cost? This is impossible to answer without knowing more. Every arena we build is custom for that particular project, and everyone’s needs are different. Request a quote so we can learn more about your project and we can put together a proposal that fits your needs and budget.